Anna Sikorska's SALT installation was set in the Light Well of St Martin-in-the-Fields, London, England during November and December 2017. It was the culmination of the Light the Well community art project in which individuals from across St Martin’s – church congregation, Chinese community, clergy, staff and members of the International Group – gathered together over time and tables of clay to carefully form the porcelain lanterns which filled the Light Well. Each porcelain lantern was filled with light from a simple string of lamps. The lanterns are glazed ceramic globes whose size, surface decoration and character differ, although the base material – and overall look – is consistent white ceramic, roughly made. 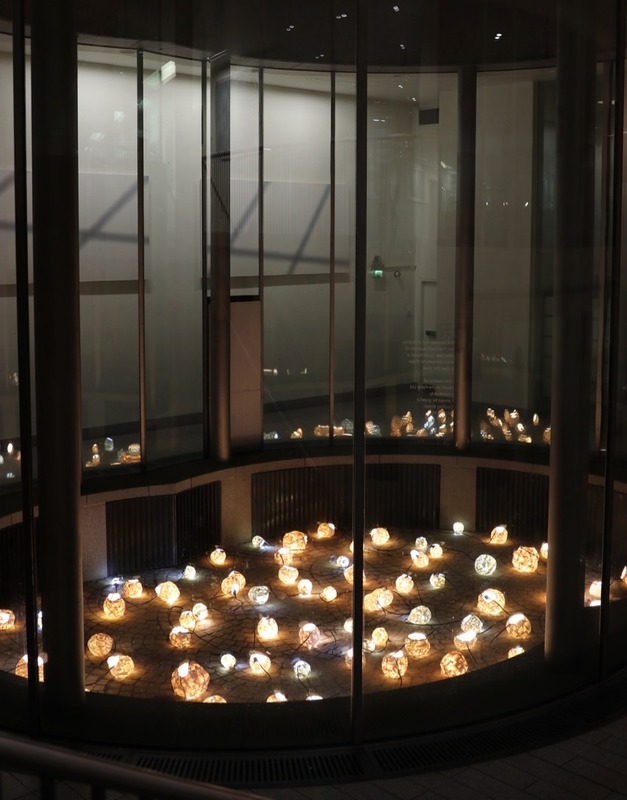 In the Light Well these lanterns were joined together with cord covering the stone floor in a random constellation. 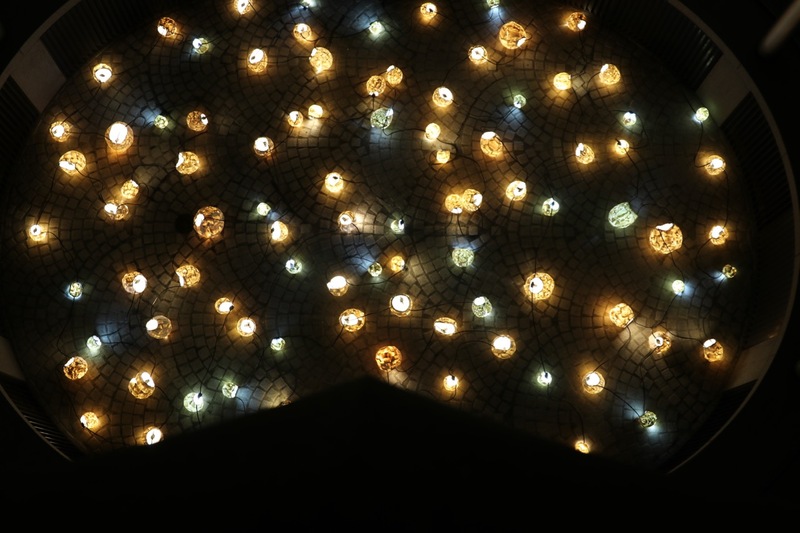 The cord also connected a light bulb within each lantern, so each one shone from within and glowed because of the translucency of porcelain. If the clay jar, the container of the light, were to be perfectly formed, then the light inside would not be seen from the outside. The light of Christ would effectively be hidden. People would look at our perfect life and not at Christ, because they would only see us. Instead, St Paul says, because we are not perfect and have difficulties and flaws we are like cracked clay jars. Which means that it is clear that where we act or speak with love and compassion, this is because of Christ in us rather than being something which is innate to us or simply our decision alone. He used this image of light in containers seen through cracks or thin translucent clay to assure the Corinthian Christians that they had the light of God in their lives, despite the fallibility and frailty of those lives. 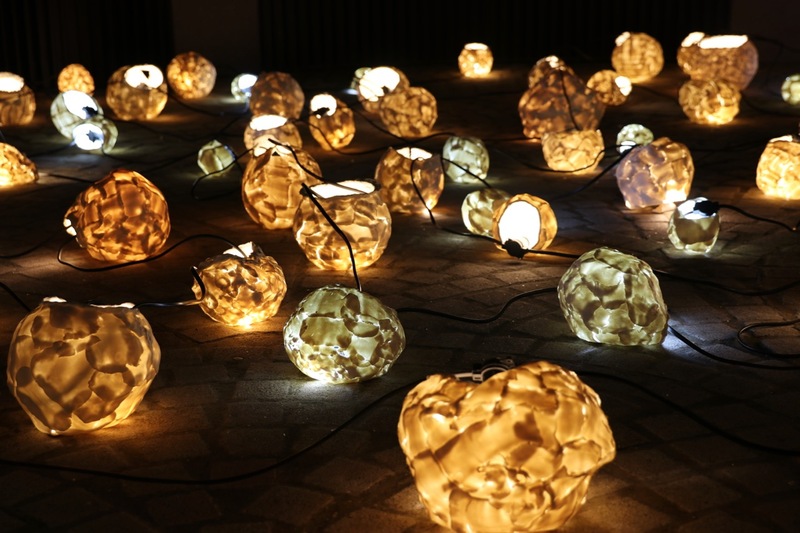 The cracked translucent lanterns of this installation lit from within are a visible realisation of St Paul’s image of light in clay jars. By linking the lanterns together, this installation also highlights another aspect in 2 Corinthians 4. Paul writes that ‘We are afflicted in every way, but not crushed; perplexed, but not driven to despair; persecuted, but not forsaken; struck down, but not destroyed; always carrying in the body the death of Jesus, so that the life of Jesus may also be made visible in our bodies.’ Paul writes of us in the plural. We are afflicted, but not crushed. We are perplexed, but not driven to despair. It is as we come together to engage with affliction, perplexity, forsakenness and being struck down that we carry in our body the death of Jesus and show the life of Jesus. It is as we come together, linked, like the lanterns, by the light of Christ that we become the Body of Christ. These verses picture us as fragile clay or porcelain containers. Each of us are like cracked or translucent clay jars because of our flaws and vulnerabilities. It is through these lines of stress – the suffering, rejection and scorn with which we engage – that the light of Christ is seen. It is as we join together in living for the sake of others – linked together as the lanterns are linked in the Light the Well installation – that we become the Body of Christ and reveal him most fully in the world. In this way, this installation shows us what it means to be the Body of Christ – the Church – in the world today. When we come together as fragile individuals glowing with the light of Christ in and through our fallibilities, we are the Church as it is intended to be. Anna Sikorska: SALT, 2017, porcelain, cords and lightbulbs. Jonathan Evens is Associate Vicar, Partnership Development at St Martin-in-the-Fields, London, England. A keen blogger, he posts regularly on issues of faith and culture at http://joninbetween.blogspot.co.uk. His journalism and art criticism ranges from Pugin to U2 and has appeared in a range of publications, including Artlyst and Church Times. He runs a visual arts organisation called commission4mission, which encourages churches to commission contemporary art and, together with the artist Henry Shelton, has published two collections of meditations and images on Christ's Passion. Together with the musician Peter Banks, he has published a book on faith and music entitled ‘The Secret Chord’.